7:00 p.m. – As the clock hits the three-hour mark, Putin addresses the audience and wishes them success in the future, taking off from the studio. With that, we conclude our live blog. Thanks for following us! 6:55 p.m. – We are now nearing the three-hour mark. Putin is taking questions from children whose birthdays are today. There are four of them in the audience, the host says. 6:50 p.m. – A girl who is celebrating her birthday today asks what Putin thinks about feminism. Putin responds that he sees nothing bad in the feminist movement and recalls his conversation with one of the former presidents of a Muslim country who lamented that girls in his country are barred from education. In Russia, Putin says, the problem is not as serious, but there is a problem that women earn less than men. He quickly adds that the same problem exists in the West. 6:43 p.m. – A girl from Ulan-Ude asks about the problems concerning Lake Baikal. Putin acknowledges that the ecological problems of the world’s largest fresh-water lake by volume are grave, but adds that the government is aware of them and they will be solved. 6:40 p.m. – A boy from Belgorod asks why Putin decided to become president and if he fulfilled his objectives in this role. Putin replies that he didn’t plan on becoming president and it was former President Boris Yeltsin who encouraged him to take up the position, even though initially he turned it down. “Boris Nikolaevich, I am not ready for this. I have to change my life completely for this, and I’m not ready to do that,” Putin says he told Yeltsin. The latter reportedly told Putin to think about it, and ultimately did put him forward as his successor. 6:35 p.m. – The host introduces an orphan boy, saying “He has a dream and only you can be the one to make it come true.” The boy then shyly says that his dream is to see Putin in person. Putin and the boy then take a joint picture. 6:30 p.m. – The hosts now announce the results of a poll on the NTV Vkontakte social media site, asking people what their priorities are. Most respondents, 40 percent, have chosen “family values.” Next in line are “health” (16 percent) and “freedom” (13 percent), followed by love and pay. “Work” is at the bottom of the ranking. “That which matters to you, is also important for the generation that’s on Vkontakte,” the host concludes. 6:21 p.m. – Putin and a boy argue about the demographic situation in Russia, with the boy saying that Russia has a declining population and Putin shooting back, “This is incorrect, that’s not true.” He claims that population growth has been positive since 2015 for the second year in a row. 6:12 p.m. – Sixteen-year-old Marina asks Putin to talk about his views on “some opposition persons.” Putin points out that there are currently several dozen political parties in Russia, which, he notes, is not very positive because it diminishes the responsibility of their leaders. The president also mentions “Russia’s neighbors” where a state coup took place, but corruption remained in place. 6:20 p.m. – A boy from the Lipetsk region asks Putin about the biggest problems in agriculture. Putin cites a shortage of seeds and cattle. Boy: How many pull-ups can you do? Putin: Eh… 15, 17. Then I hurt my shoulder and had to stop. And you? 6:09 p.m. -Putin recalls that until recently he used to do 15 to 17 pull-ups in the morning, but once hurt himself and avoided doing pull-ups since. A boy responds that he can do 25 pull-ups. 5:59 p.m. – The host reads out a question asking whether Putin supports online censorship. Putin replies that there is no censorship in Russia and reiterates that he considers freedom a fundamental value for him. At the same time, he adds that there should be measures to stop the spread of harmful information on the Internet, such as the messages of suicide groups. 5:55 p.m. – The live broadcast is nearing its two-hour mark, but Putin is not showing any signs of fatigue. The “adult version” of such Q&A’s usually lasts around four hours. Putin also looks decisively more casual for the occasion, wearing a short-sleeved white shirt. 5:50 p.m. – About 12,700 people are watching the live translation on the Vkontakte social media page. The transition from one historical period to another is another mystery, he says. 5:29 p.m. – Putin is asked: “Do you have a political successor?” He says it is international practice to indicate a successor, but adds it is up to the Russian people to elect their leader. 5:20 p.m. – In the “foreign policy” category a child asks whether there are plans to colonize Mars. Putin delivers a long lecture about the planet, but takes a long time to answer the question. He then says there are plans to explore the planet “with our European colleagues” in 2019. 5:20 p.m. – NTV channel launches an online poll to find out from what age children would like to have the right to work. 5:10 p.m. – While Putin talks, the camera zooms in to show a girl drawing a sketch of Putin, surrounded by children, in her notebook. Another girl is shown diligently taking notes of Putin’s answers. 5:07 p.m. – A young member of the team that built the plane model asks about the future of Russia’s energy sector after current energy sources dry up. Almost an hour into the broadcast, it is the first serious policy question. Putin responds there are a range of alternative energy sources but they must first be cheaper than fossil fuels. 4:56 p.m. – A student asks Putin about U.S. director Oliver Stone’s documentary about him, “The Putin Interviews,” and what he liked the most about the filming process. Putin responds that he liked Oliver Stone himself because he is an “unusual” and “deep” person. 4:54 p.m. – Another question to Putin: Why didn’t you use an umbrella during the heavy downpour on June 22? Putin responds he just didn’t think about it. 4:47 p.m. – Putin defends the country’s Unified State Exam, saying that the existing model is not perfect but it helps students from the regions get into leading universities. He adds that more than 60 percent of students at top Moscow universities come from the regions. Putin tells a kid in Sochi he hasn’t made up his mind on whether he will leave his post or not – no mention of the upcoming election. 4:38 p.m. – A ten-year-old boy asks Putin for his most prominent childhood memory. Putin responds he spent a large part of his childhood “on the streets” of Leningrad, now St. Petersburg, and describes doing sports, and specifically martial arts, as having had a positive influence. 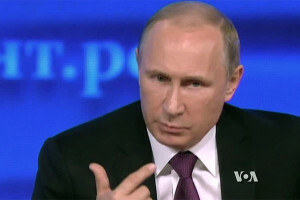 4:34 p.m. – The host asks Putin to list the three biggest values in his life. After stalling for time, Putin responds: life itself, followed by love and freedom. 4:30 p.m. – A boy asks what Putin will do when he leaves the presidential post, to which Putin, laughing, replies that he hasn’t decided yet if he is going to quit. 4:25 p.m. – A teenage student asks Putin what he would do if he could stop being president for one day. Putin responds that he considers himself an “ordinary man” and lives a normal life. He tries to find time for creative self-development, listening to music, practicing sports and mingling with friends. He adds that little has changed after he became president and that one day he’ll have to stop being president, according to the Constitution. 4:23 p.m. – Putin reveals that his nickname was “Platov” when he worked in the KGB secret service. So far the tone of this discussion between Putin & kids is pretty Kim Jong Putin. 4:22 p.m. – The first question comes in: Putin is asked if he uses social media platforms. He answers that he works so late that he can “only dream about getting to bed.” No time for social media, then. 4:18 p.m. – Putin attempts to loosen up the audience with a joke about smart kids and glasses, but gets no emotional response from the audience so far. 4:15 p.m. – Putin describes how the 2014 Olympic Games changed host city Sochi, including how they led to the creation of the Sirius center for gifted children. 4:13 p.m. – Putin finally appears in the hall, accompanied by the TV hosts. He is almost fifteen minutes late. 4:08 p.m. -The television hosts warn that the president might be another ten minutes late. They ask the children casual questions to pass the time. 3:52 p.m. – A live translation is already being shown on NTV’s Vkontakte page, here. The feed will be broadcast on NTV’s website and its television channel at 4 p.m., when President Vladimir Putin is set to make his appearance. Vkontakte statistics show 5,000 viewers were following the live feed at the time of writing. Russian President Vladimir Putin is set to meet with more than 800 students at the Sirius education center for gifted children in Sochi, on the Black Sea coast. He will answer questions from students on site and children across the country, who sent in their queries via social media. The visit will be broadcast live on the NTV state-controlled channel as well as the channel’s YouTube, VKontakte and Odnoklassniki social network pages. Putin regularly visits the Sirius center, which was established in 2014 at his initiative. The question and answer session follows on his traditional Direct Line on June 15, which lasted nearly four hours.